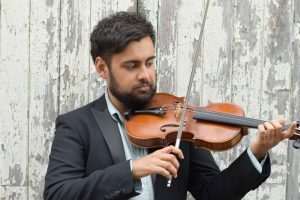 Living in South London and born to an Irish and Trinidadian background, Fiddle player Matt Tighe is quickly making a name for himself in the world of folk and Traditional music. Now twenty one years old, he has been described as a, “fiery virtuoso”, and has already had an extensive experience in performance, playing at many festivals and clubs within the UK and Ireland. He also has great experience in teaching music, and has taught with virtuoso accordionist, Luke Daniels for Daniels’ organization, Gael Music. Matt was also part of the, “On Drover Tracks”, tour with Daniels, Miranda Rutter and Matheu Watson. Matt has developed his own style of playing which has been greatly influenced by his two teachers Brendan Mullcaire and Dermot Crehan as well as his frequent trips to Glasgow. Matt has won numerous awards such as the London Fiddle Champion and in 2013 was invited to play at the event and adjudicate the competition. Matt has also won numerous All Britain Championships, been a finalist in the Danny Kyle Award at Celtic Connections and been a nominee at the BBC Radio 2 Young Folk Award. His much anticipated debut album will be released in September on the Greentrax record label, having been produced by the eminent Brian McNeill and recorded in the Highlands. He studied music at the Brit School in London and continues his studies at Trinity Laban Conservatoire of Music and Dance under John Crawford.